We believe that ESG considerations, especially good corporate governance and transparency towards shareholders, are key drivers for sustainable value creation. We recognise our shareholder rights and responsibilities as an integral part of our commitment to responsible investment. We review our constitutive voting principles periodically to keep them aligned with best practice. In the case of internally managed equities, we make use of our influence as a responsible shareholder by directly exercising our voting rights. For the externally managed portfolios, we work with the relevant portfolio managers to execute our proxy votes and related engagement activities. We review the voting policies of external managers during the due diligence process to confirm compliance with our policy. 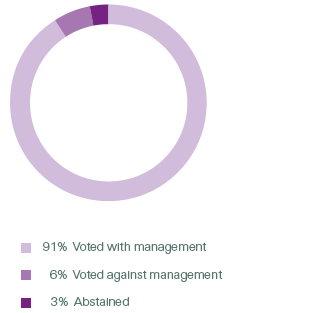 In addition, external managers are required to report on voting activities conducted on Swiss Re’s behalf. 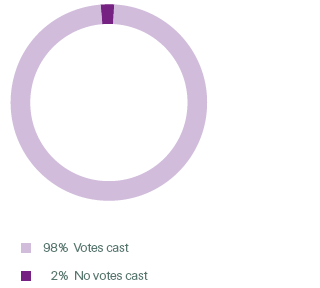 In 2017, we exercised 98% of our voting rights of our listed equity portfolio.1 We voted on 4 923 voting items through our external managers. We voted in line with the respective management resolution recommendation in 4 504 cases (91%) and against it in 295 cases (6%). In 124 cases (3%), we abstained from voting. In addition to shares in listed companies, investments in our equity portfolio include equity exchange-traded-funds (ETFs). The fund managers cast votes on these ETFs for all investors in accordance with the fund managers’ own voting policies and processes.